Dolphins are considered one of the world's most intelligent creatures (with the exception of humans, of course). Long before mankind even began to fathom taming the sea, there were stories of dolphins guiding persons stranded on the lonesome waves. Sailors recount countless encounters with dolphins swimming at the bow of their ships and the ancient Greeks deemed them to be a sign of a good voyage. Dolphins were believed to bring messages and blessings from the sea nymphs and were the off-springs of Amphitrite, the Greek sea goddess. The Dolphins' omnipresent smile makes those who encounter these majestic creatures feel a deep connection to these wild animals. Dolphins are the ultimate free spirits and highly social creatures; they display a level of camaraderie and unity that is rarely seen in the animal kingdom. There's no limit to the number of ways people choose to depict these loveable creatures. They are drawn in a variety of colors, shapes, and sizes, and with a plethora of motifs. The meaning of each motif depends on the elements that have been incorporated in the tattoo design. Dolphin tattoos tend to be wore by women, but guys who surf embrace this symbol as a representation of the free-spirited nature of a surfer. They aren't held down by obligations or boundaries and are free to go with the flow, just like the dolphins. Tribal tattoo designs originate from various parts of the world, including South America, Africa, Polynesia, and North America. Generally, these tattoo designs symbolize a connection to Nature or Family and have a spiritual bond with the culture from which the design originated. When tribal designs incorporate dolphins, they represent a cultural connection with the ocean, Grace, and Harmony. Tribal Dolphin tattoos also symbolize strong family bonds. These designs tend to be associated with, but not limited to, the Polynesian culture because of the long established relationship between islanders and dolphins. Celtic tattoos are deeply rooted to Spirituality and Paganism. In general, Celtic knots symbolize the interdependence of several elements of a spiritual nature. The intricate interlacing of lines in a Celtic tattoo speaks to the connectivity of lovers or humans with God and Nature. Celtic Dolphin tattoo designs represent a deep spiritual harmony with Nature, Community, and Family. This pairing is relatively uncommon, since both creatures represent different natural elements, Water and Air. Regardless of this, they symbolize a need to be free. Butterfly tattoos represent a bond with Nature, Innocence, Freedom, and Transformation, while dolphins are the epitome of Grace and Frivolity. Generally, persons who feel as if they are trapped by a situation express their desire for freedom with a tattoo design that incorporates both of these elements. In Taoism, the Yin-Yang symbol represents the balance between equal, yet opposing forces - Good balances Evil, Night balances Day, Female balances Male. Both are interdependent and complementary, with each force giving rise to the other. 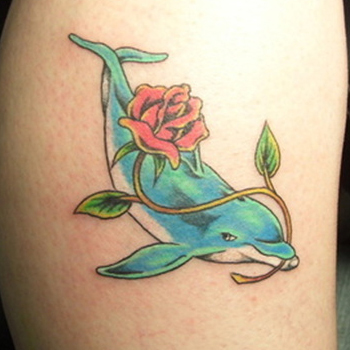 This symbolism carries through to tattoo designs that incorporate dolphins and epitomizes living in Harmony and Balance. The heart doesn't only symbolise Love, it also represents a spiritual morality, Joy, Compassion, and the strengthening of emotional bonds. Heart Tattoo designs that also feature dolphin symbolize Harmony, Community, and the strong bonds of Family and Friendship. Regardless of which variation you chose, dolphin tattoos are a great way to show off your playful nature and lets the world know who you are and what you're about. You can incorporate any element into your design and create a tattoo that speaks to your personality; the only limit is your imagination. If you need some inspiration, then visit our design page at www.itattoodesigns.com or take advantage of our Custom Design Service, where our team can create a truly unique piece for you.